Have you ever heard of a “Living Will”? It’s an important document in which you can specify what care and treatment you would want, in case you are no longer able to make decisions about your own health. You make these decisions ahead of time, while you’re still capable of understanding their impact. 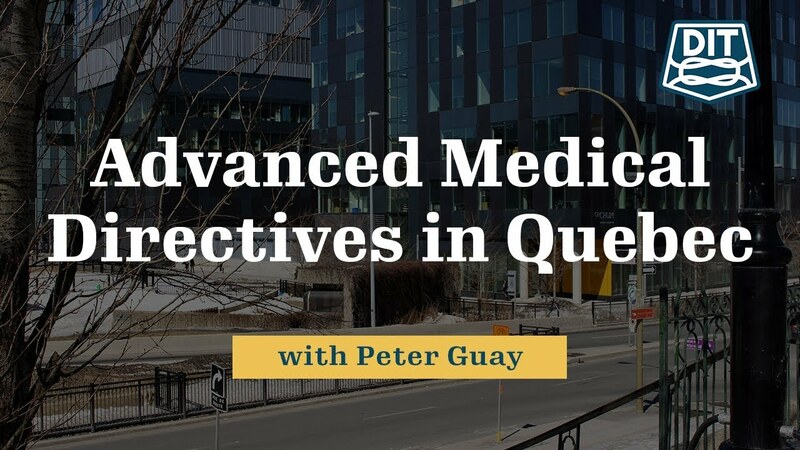 The Régie de l’assurance maladie du Québec (the RAMQ) has created a centralized directory, where you can draft just such a document, called an Advanced Medical Directive1, and make it available to doctors and caregivers in our healthcare system. If you’ve watched my videos since the beginning, you may have seen the series I did on the importance of having a will, mandate and power of attorney. If you haven’t, here’s a quick recap on the difference between them: A Power of Attorney is a document through which you delegate authority to someone else, to sign legal documents on your behalf. A Power of Attorney is only valid if you’re of sound mind and capable of revoking it. As soon as you are no longer able to make decisions for yourself, a Power of Attorney isn’t valid anymore. That’s when your Protection Mandate comes into play. The Protection Mandate, which is also known as an enduring power of attorney outside Quebec, lays out who you want to make decisions on your behalf when you are incapable of making them yourself. In it, you name a Mandatary to make decisions about your finances and healthcare. When you ultimately pass away, your Protection Mandate isn’t valid anymore and your will takes over, and it becomes the guiding document to distribute your assets to your heirs. The concept of a living will, and the new Advanced Medical Directive, is essentially an extension of your mandate. Decisions about your healthcare in particular can be pretty heavy and your Mandatary may have to face challenges from other members of your family who don’t agree. It can put your Mandatary in a really tough position. The Advanced Medical Directive provides your Mandatary, and your doctors, with more specific guidance about the treatments you would and would not want to receive. These instructions are held in a central registry that all doctors can access. If you were to arrive at the hospital and your Mandatary or next of kin weren’t available to make decisions about your healthcare, your doctors can refer to this directory for guidance on your preferences for treatment. It’s important to understand the context in which these instructions will be used. These directives only come into play if you’re suffering from a serious or incurable medical condition in an end-of-life situation. In other words, if you are in a coma that is deemed irreversible, in a permanent vegetative state, or if you have severe dementia with no possibility of improvement. If you’re in one of these situations, and you aren’t able to comprehend the treatment options and their consequences to decide for yourself, then your advance directives take precedence. The types of treatment we’re talking about here are whether you accept or refuse to have CPR administered, to be hooked you up to a ventilator, to have dialysis performed, or to be force fed or hydrated. These decisions are serious and deserve reflection. You should discuss these decisions with your spouse and/or with your Mandatary, assuming you’ve already drafted a mandate. Another important thing to note here is only you can revoke your advance medical directives. If you do want to cancel them, they need to be formally revoked using a form provided by the government. I always say that the best prescription for a successful estate plan is that there be no surprises. The Advanced Medical Directives help to reduce uncertainty for your family and ensure that they have fewer reasons to disagree over your affairs.